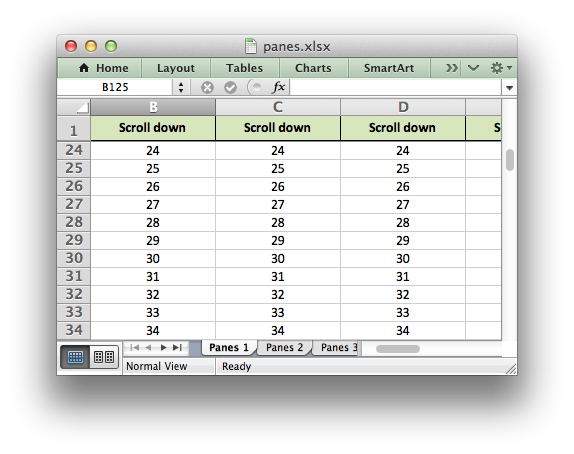 An example of how to create panes in a worksheet, both “freeze” panes and “split” panes. See the freeze_panes() and split_panes() methods for more details. # Set up some formatting and text to highlight the panes. # Example 1. Freeze pane on the top row. # Some text to demonstrate scrolling. # Example 2. Freeze pane on the left column. # Example 3. Freeze pane on the top row and left column. # Example 4. Split pane on the top row and left column. # The divisions must be specified in terms of row and column dimensions.